Coming out of this beautifully-labeled and well-shaped bottle, is a strikingly dark porter. Even in the pour, it is a deep mahogany or chestnut. In the glass, it is even darker and is topped off with a rich, creamy, brown head. It dissipates fairly quickly, leaving solid lacing on the glass and just a skim of head on top. The smell is quite enticing - like date squares - a mix of dark fruit aromas with lightly-roasted oats or bready base. There is also some coffee and chocolate in there, with the former out-smelling the latter. The flavour has a lot of coffee in it, and has a dark, roasted flavour. To balance the bitterness & roasted notes, there is also some brightness to it, from fruit flavours... which are just slightly tart - like overripe raspberries or... almost a chocolate-orange combo. Something about its sweetness and smoothness reminds me of some milk stouts. The beer is smooth, with a body that's just on the watery side of medium. There is some nice bitterness in the finish as well. The carbonation is quite tingly, but not aggressive at all. 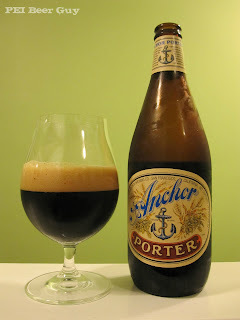 Overall, this is probably one of the best commercial porters I have had. I think I'd pick up a bottle again the next time I see it, without a second thought. Well... maybe, "Should I get two?" I love everything Anchor does. I wish we could have them on the island. I got to have their beer on tap in San Francisco. The Old Foghorn Barleywine is such a treat. I agree...this is an excellent porter. how are you guys getting anchor on PEI? We're not! Like most of my beers, I have to get them from "away".